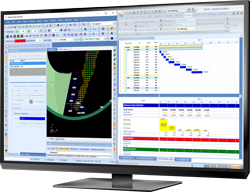 Earlier this year, we released our short-range ore control modeling & design tool, Deswik.OPSTS (Open Pit Short-Term Scheduling). This tool allows open pit mine planners to quickly produce a production plan for the 9 to 12 weeks planning range up, down to a daily planning resolution from a single pit shell solid. The overarching aim, when developing Deswik.OPSTS was simplicity and speed. The idea was to build a tool which could simply have a single pit shell solid fed into it and within a few seconds have a schedule created which has been benched out and blocked. We have achieved this, while also catering for complexities which come from operating in the real world. The tool has been intended to provide immediate feedback. As soon as you move a point in your polygon or digitize a line, the solids are cut, interrogated against the block model, your formulae executed, and the task in the scheduler updated with the new duration, and the schedule recalculated. Normally a laborious process in other products, it is executed immediately in Deswik.OPSTS. With the 2017.2 release, we have also included support for drill and blast activities which have a different shape to the excavation task. As is the case in many operations, the drill and blast process is run independent of the excavation process, but, of course, they are inter-dependent. So, if you have your blasting over a 15m bench defined using blast master polygons, and mining is over 5m benches and you want to allocate material destinations on a daily basis (which is a lot smaller than the blasted area) – Deswik.OPSTS can cater for this. Ensuring that only blasted material is mined is also taken into account automatically using dependencies generated by the tool. As with all Deswik products it is nicely integrated with other modules, including the Deswik.OPDB (Open Pit Drill & Blast) and Deswik.DO (Dig Optimizer) to streamline the process. Integrated for upstream and downstream stakeholders (i.e. drill and blast engineers, long-term planners and middle planners). For more information or to organize a demo, contact your nearest Deswik office.